I used the slow shutter speed to capture the motion of the highway. A shot that fully deserved a top 5 finish. Maybe you should stick to only B&W?! Congrats on your top 5 finish. Very timely image. A good artistic rendition. Congratulations on your top 5 finish. John, WaaHoo!! Way to go Utah. You really caught the drama of the scene and the garbage that mixes in. Wonderful. YAAHOO! Congrats John on your 5th! errrr 4th that is! Message edited by author 2005-11-20 14:35:50. Garbage ... simply garbage ... 5th place garbage that is, way to go John, this was a great study of everyday life. Interesting composition, although the truck is either too central or too motion blurred. My only 10 score in this challenge. 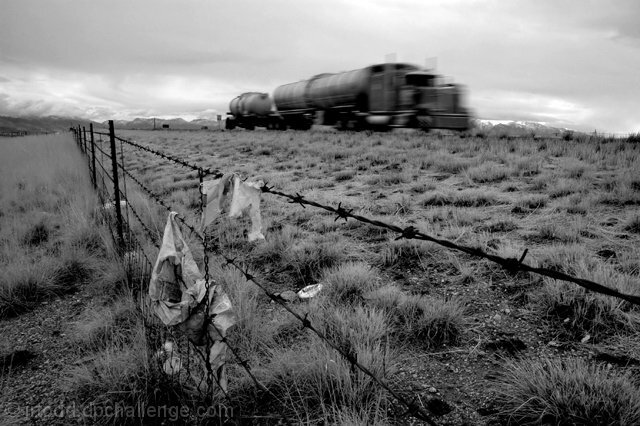 The isolation and desolation are really communicated well, the movement of the lorry helps a lot there and the lines of the fence and road leading off to the left into the mountains add an uneasy feeling. This is the only B&W conversion which works really well in this challenge. I like the lines of the photo, and I think having chosen b&w is a good choice for it. Good luck. I love this shot! In my top three. wicked shot. love the blurring on the truck. fantastic picture! Probably a 10 if the truck weren't in the background and there was more detail in the weeds on the left side of the fence. Top 10 for sure. nice ir effect. like the dof and shards of old bag caught on the fence. nicely done. A really interesting take. Great detail and a really strong leading line. I don't know where to start, everthing is great about this photo. I'd have to say I like the contrast and composition of this photo best. It has very good tone and mood also. very nice shot. i love how you got the truck in the back, it balances the whole picture. This is nice. I like the ominous feeling the speeding truck give to this picture. Very nice composition and B&W suits this picture very well. This is one of the more interesting photos here. I like the foreground and background subjects. The focus on the garbage makes clear the main subject. Good job. Beautiful study in b/w. I'm also (and this is going to sound weird) REFRESHED to see a non-staged shot in this challenge. Great job and good luck! Proudly hosted by Sargasso Networks. Current Server Time: 04/24/2019 09:49:11 AM EDT.